Published by momo on December 22, 2012 in Uncategorized. Closed Tags: border, death at border, distress at sea, news, somalia. 21 dead migrants found on Lesvos Islands’ coast, two survivors – the rest is still missing! Published by momo on December 15, 2012 in Uncategorized. Closed Tags: 2012, death at border, dinghy, distress at sea, greece, Lesvos, Mytilini, news, Thermi. On Saturday 15th December in the early morning hours the coast guard found 18 corpses of migrant men and one survivor in Thermi, Lesvos. Until now 21 corpses have been found, two persons have survived (one is in Mytilini and one in Turkey) and seven are still missing. The survivor found first on the Greek side informed the authorities that they had started with a ship of 30 migrants from Turkey which capsized on Friday. the authorities try to locate the rest of the migrants in the sea now – among them two women and two children. Only one 16-year-old survivor has been plucked out of the water and was hospitalised in the island capital Mytilene and another 17-year-old on the Turkish side. The young boy found in the sea near Lesvos told investigators most of those on board the boat which also carried women and children were from Afghanistan with only two persons from Turkey. Greek public television Net said two women and two children had been among the passengers. The group set sail from the western coast of Turkey on Thursday but ran into bad weather that sank their boat during the night, about two miles off Lesvos. UPDATE: Two of the corpses were recognised by relatives living in Greece and Sweden respectively. One of the is a 17-year-old whose cousin came to recognise him from Naxos where he is living and the other is a 42-year-old whose brother came from Sweden to check for his whereabouts. Through the recognition of the 17-year-old it became known that there has been found another survivor on the Turkish side. The young survivor found in Lesvos left hospital on Tuesday 18 and was transferred to the detention cells of the coast guard. Published by momo on January 16, 2012 in Uncategorized. Closed Tags: border, death at border, distress at sea, download, Evros, greece, infomobile, Ioanian sea, report, zakynthos. Published by momo on September 24, 2011 in Uncategorized. Closed Tags: afghan, death at border, distress at sea, fortress europe, Ioanian sea, kurdish, sans papiers, zakynthos. Published by momo on September 4, 2011 in Uncategorized. Closed Tags: 2011, death at border, dinghy, distress at sea, Ioanian sea, Kefalonia, news. At least four immigrants drowned in the Ionian Sea today, when an inflatable boat sailing about 80 nautical miles west of Kefalonia island, sank on early Saturday morning. Eleven immigrants survived. One of them, whose condition was critical, was picked up by a navy helicopter and the remaining ten were picked up by turkish ship «MEHMET DADAYLI 1». The same ship discovered the 4 corpses. Published by momo on July 28, 2011 in Uncategorized. Closed Tags: Evros, greece, interview. Published by momo on April 5, 2011 in Uncategorized. 1 Comment Tags: about the blog. This is a new blog created in solidarity with migrants and refugees getting lost at the borders of Europe. In solidarity with their relatives and friends. It is planned to become a small structure of support, providing answers to procedural questions, i.e. of searching for somebody who tried to cross a border but never appeared again and contacts to the institutions, NGOs and individuals that can help. The reason for building this blog are the destinies of people who lost their relatives at the land border between Greece and Turkey – in the region of Evros. This blog is also a space of communication about stories of loss and of exchange of experiences. Lost at Borders is a Blog made by a network of solidarity people to help in finding people who got lost at the Greek borders. We are a group of antiracist activists from different countries who have been already involved in the search of immigrants who got lost at the border between Greece and Turkey. Unfortunately every year hundreds of people disappear while trying to cross the European borders leaving their families and friends behind with anxiety and fear about their whereabouts. Since moving populations such as migrants and refugees often have their relatives in other countries waiting for them, it can be quite difficult to find some information on what has happened when somebody is missing at the border. We want to help and fill this information gap. We want to connect the relatives and friends of border victims to each other and we want to let you know and feel that you are not alone on this journey! The borders that separate our world into pieces called nations are a construction of walls which have open doors for some while for others they are closed. We do not see them as a protection shield but as a killing machine that has no reason of existence. Our struggle is for a world without borders an for free movement of all people. NO BORDERS! 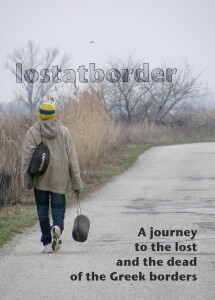 Lost at borders is a solidarity and support blog created to help in finding people who got lost at the Greek borders.